If we all ate insects, the world would be a better place. The reality, however, is that the subject of insects-as-food has garnered millions of hits on foodie blogs, but few takers in the grocery store. Not that it’s not a great idea, but farming insects for other purposes – fiber, dye, pest predation and as food for the animals that we do choose to eat, for example – has millennia of history behind it and constitutes a small, but enthralling, farming subculture. Silkworms are one farmed bug whose product definitely doesn’t gross us out. They are the larval stage of the silk moth which was first domesticated in China over 5000 years ago and, not unlike heirloom tomatoes or apple trees, have since been bred into over 1000 unique strains that produce silks of varying qualities. Today, silk farming remains a predominantly cottage-style industry employing the rural poor in many Asian countries. It is synonymous with mulberry plantations, as the leaves of the white mulberry tree are the sole food source of the silk worm. There have been some attempts to tinker with silkworm genes, including the introduction of spider DNA into silkworms in hopes of engineering a stronger silk for industrial applications, such as airbags and bullet-proof vests (spider silk is stronger than steel, but arachnids are tough to domesticate). Despite modern efforts at genetic engineering and mechanization, most silk is still produced the old-fashioned way: the single mile-long thread that forms the cocoon is manually unwrapped by the silk farmer and wound onto a spool. Naturally, the grub-like pupa inside each cocoon is sold for food. If silkworms are the iconic plant-pest-turned-export-commodity for Asia, cochineal, a tiny aphid-like bug that feeds exclusively on nopales (prickly pear cactus), is the Latin American version. Cochineal doesn’t produce fabric; rather, squishing the little bugs makes a deep red dye, also known as carmine, that is used to color everything from wool sweaters to lipstick. Cultivated by the Aztecs and Incas since antiquity, it was elevated to a global commodity in the 17th century by the Spanish, who exported nearly as much cochineal from the New World as they did silver. It went as far away as India to dye silk saris and the British used it for the infamous ‘redcoats’ worn by their soldiers during the Revolutionary War. As you might expect, production declined as artificial colorants were developed in the 19th century, though in recent years there has been a resurgence for cosmetics and food dye, as some of the artificial red coloring agents were found to be carcinogenic. In the dusty hills of Oaxaca, a few farmers still raise cochineal in the traditional manner, hanging little tubular cochineal incubators – which are woven from palm fibers and referred to as zapotec nests – in their nopales orchards. Today, however, Peru is the world’s top exporter, producing 850 metric tons of carmine annually. Another red bug – ladybugs or, if you’re British, ladybirds – are cultivated by farmers not as an end product, but as an insect militia to protect their crops. As with mammals, in the insect world there are both herbivores and carnivores. As cute as they are, ladybugs belong to the latter group and feed primarily on sap-sucking insects like the cochineal aphid and its relatives. They’re so effective at it, organic farmers pay insect farmers to cultivate ladybugs en masse for them to release into their fields. A gallon of ladybugs – or about 72,000 insects, which is enough to treat a one-acre crop – goes for about $95. For that matter, the biological pest control industry utilizes dozens of other bugs to do the dirty work of all-natural pest control, currently a $3 billion industry. Moving on from farming bugs that eat pests to those that feed livestock, we encounter the esteemed housefly. Many commentators have suggested that farming insects for animal feed is a necessary stepping stone in acclimatizing Western tastes to accept eating the bugs themselves. A company in South Africa has been farming flies since 2009, winning numerous awards, grants and investor dollars for their approach to producing animal feed with something other than soybeans and fishmeal, which are currently the primary ingredients. To be more specific, they’re after fly maggots, which are processed not only into chicken and aquaculture feed, but a soil conditioner made from maggot poop. However, the unsurpassed king of fly larvae whose feces make great compost is the black soldier fly. Unlike house flies, soldier flies aren’t attracted to houses (and are notoriously slow-moving and easy to catch if they do get inside) and their larvae actually outcompete housefly larvae in piles of organic waste. To bring home the sales pitch black soldier fly farmers are also sure to mention that their bugs don’t transmit all sorts of pathogens like house flies and their larvae actually render compost piles odorless – even compost piles containing meat. Plus, they are self-harvesting. When the larvae have had their fill and are ready to pupate, they have an instinctual impulse to crawl up and away from the compost pile. Soldier fly farmers raise the larvae in special containers that direct the climbers straight into a pit from which they can’t escape, where they await their fate as food for fish, swine, chickens and a host of other livestock. Some savvy industrial designers have created tabletop models for you to raise your own soldier fly larvae in your kitchen. They are, after all, edible by humans. While housefly maggots and soldier fly larvae are all the rage these days for their dual potential in composting and as a feed source, old-fashioned earthworms are still number one for large-scale composting operations. It’s important to note that worms are the way to go for compost that’s heavy on cellulose and light on nitrogen-rich compounds. In other words, worms will eat paper, cardboard and sawdust along with food scraps and manure, while their larval counterparts avoid those carbon-rich substances, but do well with carrion. For this reason, some composters prefer to combine black soldier fly larvae with worms for the best of both worlds. Another note: don’t confuse the brown earthworms in your garden with composting worms. It’s the small red ‘wigglers’ that vermi-composters use as they’re much more efficient at turning waste into soil amendment. But in case you’re wondering, for human consumption the brown garden earthworms are recommended over red wigglers (feed them cornmeal for at least 24 hours before consumption to get rid of the earthy flavor). Most vermi-composters breed their own worms, but to get started you need to contact a worm farmer for a starter batch. Current wholesale prices are around $40 per pound. 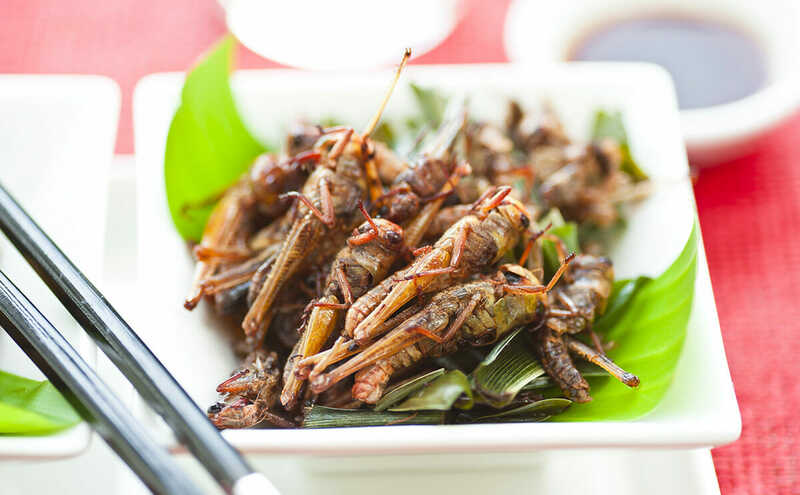 Because they are so easily raised on waste products, worms, maggots, grubs and larvae all make a very sustainable food source, but insect farmers today are concentrating on bugs with a slightly lower gross-out factor when it comes to human food: crickets. Some sources estimate that there are now 30 or so ento-startups in North America, up from just one in 2008 (ento, as in entomology, is the in-word to denote cultural activities engaged with insect-farming/eating: i.e. ‘omg, that’s totally ento’). The reason that the majority of these companies focus on crickets may have to do with the fact that they are raised on fresh food we can relate to, like lettuce and oatmeal (plus, we have a pleasant association with their nocturnal chirping). First came San Francisco-based Bitty (cricket flour), quickly followed by Chapul and Exo (cricket bars) in out of New York and Colorado, respectively. Chirps (cricket chips) and Bug Muscle (cricket nutritional supplement) are now gearing up to launch their product lines, as well. If you want to save money and grow your own, however, there may soon be a tabletop farm available for raising the cricket’s close cousin and culinary equal, the veritable grasshopper.